Announcement Follow me for sales, giveaways & updates. © Judit Just 2014-2019. All rights reserved. Products Displayed on this website are Copyrighted by Jujujust. Jujujust is a trademark owned by Judit Just. Under no circumstances should the content of this shop be reproduced, replicated or commercially distributed. The products displayed in this shop are for PERSONAL USE ONLY and should not be sold without prior consent from Judit Just. Violations of these terms could result in legal action. MADE TO ORDER = Due to a very high volume of orders, the turnaround time for made to order tapestries currently is 12 weeks. Thank you all for your patience! Follow me for sales, giveaways & updates. I wanted one of Judit’s tapestries for a long time before I finally bought one. They aren’t cheap, which is why I hesitated. Now that I have one, I can say that it is worth every penny. I can tell how much thought, hours of work, and beautiful materials went into creating it, and for that I appreciate it even more. Everything about it, right down to the way it was wonderfully packaged for shipping, is fantastic. It hangs in my bedroom and I love looking at it, touching it, and enjoying it every day. If you are hesitant to purchase like I was, don’t be! Rest assured, you will not be disappointed! Love all the colors and texture. It is a wonderful addition to my home. 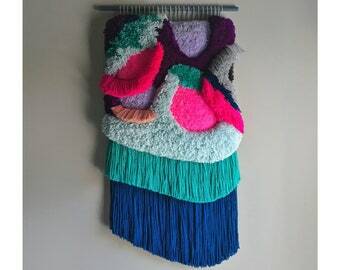 Judit Just is a textile artist raised and born in Barcelona, Spain, but she currently lives in Asheville, North Carolina where she moved in 2013 and where she develops her textile’s brand, known by Jujujust. She studied fashion design, sculpture and textile art, where she specialized in weaving and embroidery. She grew up surrounded by textiles and actually learned weaving craftsmanship through her mom when she was little. 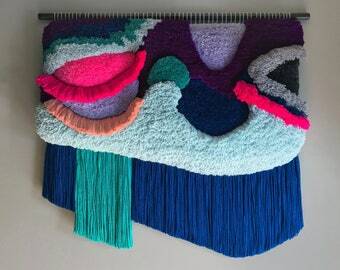 She takes some old weaving techniques and gives it a twist using vibrant color combinations and a bunch of beautiful vintage threads. No returns or exchanges. If your item goes missing or is damaged in transit I cannot refund you, please purchase at your own risk. I try to do my best when describe and photograph the items. Please read the descriptions of items carefully and if you have any questions - ask before placing the order! *Please note that we do not refund the shipping dues. Shipping costs will also not be refunded for uncollected items. We do not take responsibility for damages or losses due to the shipping. Payment is expected within 3 days of ordering. If I don't receive the payment, I will contact you prior to the cancellation to discuss. I understand that sometimes the checkout process can be confusing so I will check to make sure there's not a mistake. I will only ship the items once the payment is cleared. Once your payment is cleared, your purchase will be shipped with USPS. MADE TO ORDER- expect around 10 weeks for your items to be shipped. Once the tapestry is done, it should take 2-8 days after shipped. All packages come with tracking number. Orders of 300$ total and over will ship with insurance. If you would like to purchase insurance for your order, please contact me prior to finalizing your purchase regarding the rate. Once the tapestry is done, it should take up to 2-3 weeks after shipment until you receive your purchase. International Buyers – Please Note: Some duties, taxes and charges are not included in the item price or shipping charges. These charges are the buyer’s responsibility. Please check with your country’s customs office to determine what these additional costs will be prior to buying. I will not be responsible if the postal service has left a notification and items were not recovered from your local office. I aim to display the colors of my products as accurately as possible, however resolution, print methods and screen settings can affect how an item is displayed, the accuracy of colors cannot be guaranteed.